The thick green volume lived on my dusty book shelf. Scrawled in gold letters, JANE EYRE by Charlotte Bronte. I promised my best friend that I would read it, some day. As she promised me, the same thing with Tolkien’s Lord of the Rings. But other books got in my way, and the lone green volume collected dust bunnies. 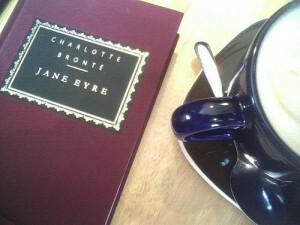 Until boredom set in, and I brushed off Jane Eyre. And I loved it (insert face palm for not reading it earlier). Since I fancy the dark side of literature, I loved the brooding landscapes, the crazy first wives, the intrigue of Jane Eyre. Of course, Timothy Dalton playing Mr. Rochester certainly helped. Again, I swoon. This month, we at the DJABC will be foraying into Jane Slayre , a lovely mash-up with bloody brilliance. After reading a few chapters, I am beyond thrilled to discuss this book with all of you, dear readers. We meet Jane, a mortal, living in a dark world full of the undead. What I enjoy about this particular mash-up is Sherri Browning Erwin’s attention to the language of Bronte and how she incorporates the bloody mayhem. If you haven’t read the original work, you would never know Bronte herself did not write her novel without vampyres and other creatures of the night. But wait, this isn’t Austen, why are you reading Bronte? True, we do focus on the works of Jane Austen; however, we are diverting our attention to those whom she influenced directly. While the Bronte sisters wrote many years after Austen’s death, they still were influenced by the novels of Austen herself. Here is an excerpt from a letter in which Charlotte discusses her opinions of Austen’s work Emma. I have likewise read one of Miss Austen’s works “Emma”–read it with interest and with just the degree of admiration which Miss Austen herself would have thought sensible and suitable–anything like warmth or enthusiasm; anything energetic, poignant, heart-felt, is utterly out of place in commending these works: all such demonstration the authoress would have met with a well-bred sneer…Her business is not half so much with the human heart as with the human eyes, mouth, hands and feet; what sees keenly, speaks aptly, moves flexibly, it suits her to study, but what is the unseen seat of Life and the sentient target of Death–this Miss Austen ignores. For more information about the life of Charlotte Bronte, visit The Victorian Web. A lovely reference guide for this period in literature. What are you most excited about in reading Jane Slayre? What questions would you like to pose to our lovely author? *Photo: Jane Eyre by Stephen Cummings, obtained through Flickr.